Most EU countries officially welcome the prospect of Turkish membership: albeit at least a decade from now and subject to consistent evidence of Turkey's commitment to democratic values. In contrast, public opinion in most EU countries appears, with varying degrees of intensity, to oppose Turkish membership. Reasons cited for opposition include: Turkey's large population (70 million and rising fast); its relative poverty and doubts about its cultural compatibility with Europe. The French, Germans and Austrians seem especially unhappy with the idea. 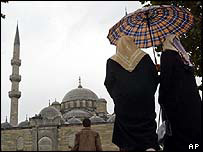 GERMANY: Opinion polls say up to three-quarters of the population oppose Turkish membership. Of the two largest political parties, the Social Democrats (SPD) say they want a "modern Turkey in the EU"; the Christian Democrats (CDU) oppose membership - proposing instead a "privileged partnership". Angela Merkel - the CDU candidate for chancellor - has appealed to EU leaders not to "encourage" Turkey. FRANCE: Has the largest percentage of Muslims (7%) in the EU. Officially backs Turkey's membership bid. But Prime Minister Dominique de Villepin says Turkey must first recognise Cyprus. However, Nicolas Sarkozy - leader of the ruling UMP party and likely future presidential candidate - is opposed. Only 20% of public opinion says Yes to Turkey joining. A leading political pundit, Guillaume Parmentier, says: "The Turkish elite has been European for centuries; but the vast democratic expansion of Turkey involves Anatolian peasants, who are not European by culture, tradition or habit". The French have been promised a referendum after the conclusion of negotiations. AUSTRIA: Opinion polls show 75% of 15-24 year-olds opposed to Turkish membership; rising to 82% among people over 55. This is the highest No rating in the EU. NETHERLANDS: Has the EU's second largest Muslim population in terms of percentage (6%) after France - and is struggling to cope with the issues of religion, immigration and integration - particularly after the murder of film-maker Theo van Gogh. Remains strongly divided over Turkey. BRITAIN: An enthusiastic supporter of Turkish membership. Foreign Secretary Jack Straw says Turkey in the EU would become "a beacon of democracy and modernity"; and a Muslim country providing "a shining example across the whole of its neighbouring region" - ie the Arab world. Turkish membership would disprove the "clash of civilisations" theory. ITALY: Another strong supporter of Turkish membership. The government stresses historical links between Italy and the "Near East"; the need to "anchor" Turkey in the West; and the commercial opportunities offered by the Turkish market. Public opinion, while not particularly hostile, appears less enthusiastic - actual support for Turkish membership standing at below 40%. POLAND: The largest of the 10 "new" EU members, who joined in May 2004 - with more than half of their combined population. 54% of the public support Turkish membership. Officials say Turkey would strengthen pro-American attitudes within the EU and consolidate Western influence on the approaches to the Middle East and the Caucasus. Poles also cite a history of close bilateral relations going back several hundred years. SPAIN: A poll showed 33% opposing Turkish membership, but 42% in favour - as is the government. Back in June, following the French and Dutch rejection of the EU draft constitution, Foreign Minister Miguel Angel Moratinos suggested postponing the Turkish accession talks until a more advantageous time. GREECE: was under Ottoman occupation for more than 400 years. Some Greeks still regard Istanbul as a "Greek" city. Another country where politicians and public opinion diverge. Opinion polls suggest only 25% of Greeks believe Turkey has a place in the European Union. The government, meanwhile, is keen to resolve bilateral tensions through Turkish integration. But it says the fate of Turkey's EU application depends, primarily, on the Turks themselves - especially where recognition of Cyprus in concerned. .
HUNGARY: was under Ottoman occupation for 150 years, in the 16th and 17th centuries. But there is little anti-Turkish feeling - around half the population supporting Turkish membership. However, like Austria, Hungary is also pressing the case of neighbouring Croatia: which, according to Foreign Minister Ferenc Somogyi, is "spectacularly further ahead" than Turkey on most accession criteria. DENMARK: Strong public resistance to Turkish membership. Danish Prime Minister Anders Fogh Rasmussen - until recently supportive - has been heard talking of "special partnerships" as well. SWEDEN: Strong popular resistance. However, the government sees Turkish membership in terms of "supporting Turkey's reform process and increasing contacts with Turkish society" - as well as Swedish business opportunities.